At the time of construction, the area was dominated by the docks and services, and it was William Cubitt, as the Lord Mayor of London who encouraged the development of homes for workers, and a church for their souls. Constructed from brick with dressings of Portland stone, the bricks were originally white but have blackened in the Victorian pollution and the dressings are claimed — if only in one book — to incorporate some stone from the London Bridge demolished in 1832. 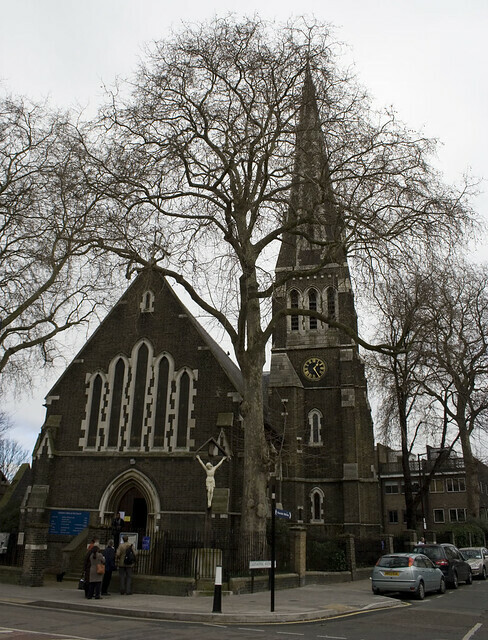 The church was constructed between 1852-4 at William Cubitt’s personal expense, and then donated to the Ecclesiastical Commissioners. However, the ungrateful clergy felt the interior was inferior, and refused to consecrate the church until 1857. Around 160 years later, and the church spire still manages to dominate the view around the area, and probably more so thanks to the blackening of the brickwork as that helps it stand out against the nearby concrete tower blocks. It also still retains the appearance of a modest Victorian town church, although it has been modified considerably over the years. I have walked past the church for several years on my wanderings around the isle, but never been inside for the doors have always been closed. However, this weekend I was passing by at an unusual hour, and the doors were open for they had just finished a service, and yes, I was free to pop in and take a few photos. I am rather pleased I did. 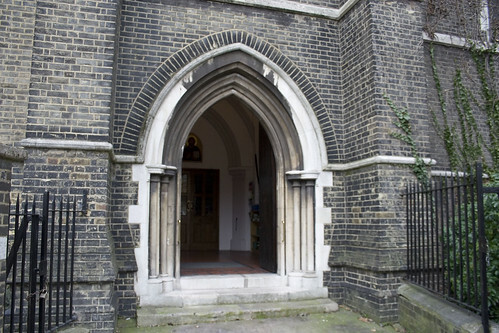 The church is still very much a community church, as was apparent from the “community hall” clutter around the place and in the 1980s, the rear of the church was blocked off and turned into offices and meeting rooms. The altar was concealed behind a very modern projection screen which sat ill at ease with the grander interior, but I doubt the Victorian builders ever expected a modern Magic Lantern to be used in a church. 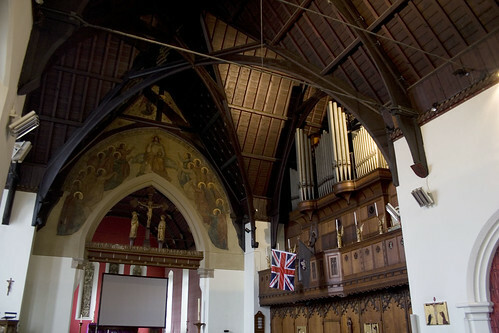 Apart from the wooden ceiling, the most striking elements are the painted murals and the church organ. The murals are actually three canvases that were painted elsewhere then applied later. 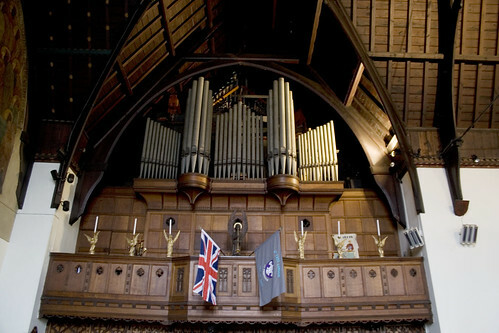 The church organ was built in 1911 and rebuilt in the 1950s when it was also flipped over to the opposite side of the nave for some unknown reason. I didn’t linger to take too many photos as while services were over, the church was still in use. I may not share the faith, but I respect that others do and I am a mere interloper in their building. The church is now Grade II* listed.